In today’s competitive fund raising environment the majority of hedge funds and alternative asset managers recognise that CRM is a key investment. It supports not just day-to-day investor relations, sales, marketing, and compliance processes but it is also a strategic investment in the firm’s business, appearance and professionalism. 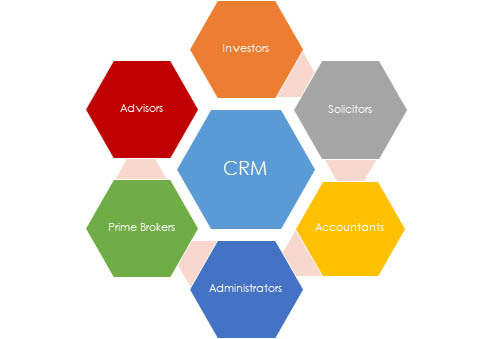 Although CRM software can deliver amazing benefits, realisation of these benefits is dependent on finding a CRM system that is good fit with your business needs. At Satuit Technologies we know that successful hedge funds approach client relationship management as a strategic process in which people, best practices, and technology are all organised to deliver superior value to their clients. The people and best practices side of the equation is discussed in our previous article called CRM’s 10 critical success factors for hedge funds. The article you are reading now addresses CRM product choices and discusses how to select a CRM at your hedge fund. At the core of a good CRM is the ability to hold details of business entities and contacts, and the complex relationships between them. In addition to current and prospective investors, relationships typically include service providers including solicitors, accountants, administrators, prime brokers and advisors. Relationship categorisation, segmentation and mapping should ease CRM navigation and facilitate intelligent reporting. A CRM should also track activities (i.e. appointments, tasks, phone calls, logged emails etc.) against each business entity and facilitate task and follow-up workflow. Storing activities isn’t just a matter of corporate memory. It is about teams having the correct information to hand to be organised and professional when interacting with outside organisations, and having the correct workflow and follow-ups in place to ensure nothing is forgotten. Hedge funds are information intensive and the ability to automatically add email and documentation is therefore key in terms of servicing clients and saving time. A CRM should therefore have a good email add-in tool and an integrated Document Management System (DMS). Business trips have a cost in terms of time and money and need to be planned. A CRM should therefore be fully featured to assist with trip planning and the software should be fully mobile. Common workflows might involve planning and researching a trip using business geo-mapping tools, retrieving data and documents via a mobile device, and after an appointment being able to rapidly add notes using voice-to-text recognition. The CRM will also need to be able to manage and to an extent automate the fund raising activity. It should be possible to track fund raising opportunities through the pipeline and to analyse them by for instance by stage, fund, rep, size etc. The processes above are typically supported by an integrated event management and campaign email management tool which allows you to register and manage subscribers including for events and roadshows. Typical email use cases might include for instance periodic NAV updates, newsletters, fund commentary or event invitations. The ability to search for and make intelligent use of the data is obviously important and particularly so as internal stakeholders as well as investors, regulators and auditors increase their expectations in this regard. It should therefore be possible to interrogate the data for both internal and client reporting purposes using a variety of tools including search, reporting and dashboards. Beyond core CRM, many hedge funds are increasing their investment in edge CRM capabilities as a means to increase their return on investment (ROI). Recent research by Nucleus suggests that edge capabilities deliver 4.2 times the ROI of core CRM. GPs should therefore consider a providers completeness of product offering to avoid a costly switch to another provider at a later date. Providers now provide additional products, modules or tools that are often designed to assist with the communication and sharing of information. Typical examples include functionality in relation to investor portals and client report automation. Hedge funds are increasingly investing in their own technology including for investor relations. Core CRM software functions deliver ROI in their own right. However, this can be increased, often as the hedge fund grows, by adding edge capabilities. Is the CRM intuitive and easy to use? Does the CRM provider meet your customer support expectations? What provisions does the CRM provider make for implementation and training? How robust are the CRM provider’s security arrangements? How extensive are the CRM provider’s compliance features? When your business changes and evolves, how easily can the system be configured? Does the CRM easily integrate data from accounting systems, data providers or fund administrators? Alan Underdown is Managing Director for Satuit Technologies, EMEA. For more information please click here. Satuit Technologies, Inc. is a global leader in client relationship management (CRM), deal management, Investor Portal and Client Report Packaging software for the asset management industry. Satuit Technologies software supports thousands of asset management employees working in sales, marketing, client and investor relations, client service and retention, compliance and finance. The firm has over 20 years of experience providing asset management clients across the globe with their CRM and reporting solutions.